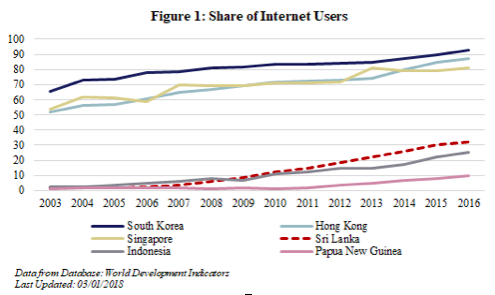 Asia’s digital economy is booming. By market capitalisation, about one-third of the largest 135 multinational corporations in the digital economy are based in Asia—major regional players include the China-based Alibaba and the Japan-based Rakuten. Southeast Asia’s digital economy alone is expected to amount to $200 billion by 2025, and Asia is likely to be several times that figure. Mobile subscriptions per 100 people in Asia rose from 71.1 to 100.7 between 2010 and 2016. Sri Lanka’s figure was above the regional average and rose from 85.9 to 124.0 over the same period. Meanwhile, the share of internet users in the region’s total population—arguably a better indicator of digital economy penetration—nearly doubled from 20.2 per cent to 37.7 per cent in the same period. However, Asia’s digital economy is evolving at different speeds and South Asian countries, like Sri Lanka, risk being left behind (see Figure 1). Latecomers must therefore substantially invest to benefit from Asia’s growing digital economy. The following discusses Sri Lanka’s current position and challenges, and some key policy measures that it can take to forge ahead. What Should Sri Lanka Do? Ensuring political stability and respect for the rule of law is the bedrock for stimulating private investment in Sri Lanka’s digital economy. However, improvements are also needed in four public policy areas: (i) foreign direct investment and exports, (ii) education, (iii) digital infrastructure, and (iv) regulations. Foreign direct investment (FDI) is critical to facilitate Sri Lanka joining Asia’s digital economy. It brings capital, new technology and skills, and overseas market connections, which are typically scarce locally. Dialog Axiata, a part of Malaysia’s Axiata Group, has brought in investments of more than US$ 1.9 billion since 1995. This has helped revolutionise Sri Lanka’s mobile phone industry and create local jobs. In 2016, Dialog provided direct employment to over 3,000 people and supported the livelihoods of over 100,000 households engaged in the supply chains of its operations in Sri Lanka. Dialog, however, is an exception to the limited FDI flows into Sri Lanka’s information and communications technology (ICT) industry. Employment and exports in Sri Lanka’s ICT industry are below potential. In 2016, around 1 per cent of Sri Lanka’s workforce (85,000 people) were in its ICT industry, and although ICT services exports increased over five-fold from $166 million in 2006 to $900 million in 2016, they still constitute only 12.6 per cent of Sri Lanka’s total service exports. By contrast, around 7 per cent of Malaysia’s workforce (1.07 million people) are in Malaysia’s ICT industry and Malaysia exports $8.1 billion in ICT services, amounting to 23.1 per cent of its total service exports. To improve, Sri Lanka could consider joining the World Trade Organisation’s Information Technology Agreement (ITA). Under the ITA, import duties and other charges would need to be reduced to zero on 201 ICT products, like touch screens, GPS navigation equipment and medical equipment. This could make Sri Lanka’s ICT goods exports more competitive and attract FDI. Joining the ITA would signal Sri Lanka’s entry as a player in the digital economy, since participants of the ITA represent around 97 per cent of global trade in ICT products. Education and training build the skills necessary for thriving in Asia’s digital economy. Sri Lanka has the advantage of a young population. Around 31 per cent of Sri Lanka’s population is between the ages of 15-34, which presents an opportunity for Sri Lanka to maximise this demographic dividend. The country also enjoys near universal literacy, thanks to decades of investment in human development. However, ICT and English language training is inadequate as the national English language literacy rate is only 30 per cent (2012) and computer literacy is 28 per cent (2017). Insights can be gained and applied in Sri Lanka from the European Commission’s Digital Education Action Plan of 2018, which includes equipping schools with broadband (to overcome barriers to internet access) and training teachers to use technology in classrooms. Sri Lanka could also introduce a dual training system like in the Philippines. This system combines theory and practical training in work environments to prepare students for employment. Through such a system, Sri Lanka could ensure that employers of Asia’s digital economy are part of the local skills development process and make Sri Lankan employees to attractive to businesses of Asia’s digital economy. Sri Lanka’s approach to digital infrastructure is improving but challenges remain. Around 53 per cent of its population has access to 4G internet, and Sri Lanka was the first in South Asia to trial 5G internet. Moreover, internet connectivity in Sri Lanka is more affordable than other Asian countries, and the government has shown interest in increasing internet access via public WiFi and Google’s Project Loon. However, there are still gaps in digital infrastructure, including implementation challenges and the lack of disposable income for ICT equipment and services. To improve this, Sri Lanka should promote zero-rating services, offered by mobile network operators (MNOs). These services allow internet users with low disposable income to access certain digital applications and websites without using their data plans. By exempting high-usage applications and websites, like Facebook and WhatsApp, from data plans, MNOs allow people to access more of the web at no additional cost. Introducing “Facebook Zero” increased the number of Facebook users by 154 per cent in Nigeria, 85 per cent in Ghana and 50 per cent in Kenya. Facebook Zero may have some undesirable effects, given Facebook’s apparent negligence concerning privacy and information flows. Nonetheless, this example highlights the success of zero rating services in developing countries. The recent privacy scandal involving Cambridge Analytica has reinforced the importance of addressing concerns around sharing and securing data in the digital economy. Digital businesses like Facebook are rethinking how they allow third-parties to access their data. As this discussion advances, Sri Lanka should evaluate and implement ways to ensure that domestic regulation protects privacy and tackles cybercrime while not hampering innovation. Commentators have argued that general laws, like the EU’s General Data Protection Regulation, are more beneficial to the digital economy than sector-specific regulations. This is important because more specific regulations may slow down collaborations between sectors, like car manufacturers and MNOs. Sri Lanka’s digital economy regulatory framework is in its nascent stages and the country has previously faced regulatory uncertainty when rolling out digital products and services. In particular, there was confusion about applicable laws when Sri Lanka rolled out MNO-led mobile money services in 2007-2010. Sri Lanka must therefore develop clear and effective regulations that are flexible and functional, via a bottom-up approach. It should prioritise this, along with developing the expertise to keep up with rapid changes to digital products and services. This would ensure that regulation does not become obsolete. Sri Lanka’s plan to establish the Colombo International Financial City (previously called the Port City), as part of its ambition to become a financial centre between Dubai and Singapore, makes this a policy imperative. Sri Lanka could either be a future player or sit on the bench as Asian digital economy grows. Being left on the bench is clearly not a desirable option for Sri Lanka’s vibrant youthful population. Sri Lanka should therefore prioritise the WTO’s Information Technology Agreement, improve its standard of ICT and English language skills, increase its investment in digital connectivity through public WiFi and zero-rating services, and introduce flexible and clear regulations based on functionality for digital products and services. More broadly, political stability and a proactive public policy are essential elements to being a player in Asia’s booming digital economy. A version of this commentary was also published by the Daily FT, Sri Lanka. Ganeshan Wignaraja is the Chair of the Global Economy Programme at the Lakshman Kadirgamar Institute of International Relations and Strategic Studies in Colombo. He is also a Senior Research Associate at the Overseas Development Institute in London and has published numerous books on trade, regionalism and development. He has a BSc in economics from LSE and a DPhil in Economics from Oxford University. On reading your article “Is Sri Lanka sitting on the bench of the digital economy?” there are a few questions that your article fails to answer. I must note that I am no expert in the field. Though this is an interesting statistic I would assume as the largest continent it would be a leader in most fields. Is this however true on a per capita basis? What I normally read is that Asia has huge potential in the growth of digital services. This is a very general statement that I would feel is always true. In my reading of the paper I find that there are a lot of mentions with regards to Sri Lanka enacting legislation that is in line with the new EU Data protection legislation. Under this topic you mention Dialog and its facilitation of joining a digital economy. You however seem to avoid commenting on Dialogs current legal disputes with SLT that can greatly change the telecommunications landscape of the country. There are also huge concerns with regards to if the current laws are written in the public interest. I would cut 3 of your 7 headings within the article. I don’t think the other 4 are honest to the title. The reason that your article irritates me is that it is filler. It lacks substance. As apparent with the length of the notes section I believe a lot of research has been done. All this article does is at best regurgitate this research. Better press might result in better policy.